In the mist-shrouded haze of the past, the world of Azeroth teemed with wondrous creatures of every kind. Mysterious Elves and hardy Dwarves walked among tribes of man in relative peace and harmony -- until the arrival of the demonic army known as Burning Legion shattered the world's tranquility forever. 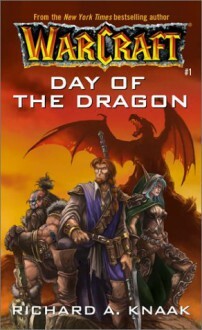 Now Orcs, Dragons, Goblins, and Trolls all vie for supremacy over the scattered, warring kingdoms -- part of a grand, malevolent scheme that will determine the fate of the world of WarCraft A terrifying upheaval among the highest ranks of the world's Wizards sends the maverick Mage, Rhonin, on a perilous journey into the Orc-controlled lands of Khaz Modan. What Rhonin uncovers is a vast, far-reaching conspiracy, darker than anything he ever imagined -- a threat that will force him into a dangerous alliance with ancient creatures of air and Þre if the world of Azeroth is to see another dawn.